This is part of an old school project of my niece showing the different tourists spots in the Philippines. Maria Cristina Falls is 320 feet high, spews 130 cubic meters of water per second and is the primary source of industrial power in the city. Iligan is also known as the “City of Majestic Waterfalls” because of the presence of approximately 23 waterfalls in the city. It utilizes 90% of its water for the hydropower plant. The National Power Corporation (NPC) has established its Maria Christina Power Plant at the outer base of the falls. Its twin cascades attract both local and foreign tourists. It is sometimes called “twin falls” since the flow is separated by a rock at the brink of the waterfall. It is also tagged as a “now-you-see-it-now-you-don’t” falls, because of the man-made controls operated by the National Power Corporation which is essential for producing electricity. According to legend, the rocks that surround the pool were said to be the fearsome magical war boat of Prince Bantogen, hero of the Maranao-Maguindanao epic “Darangen”. This entry was posted in Postcards and tagged maria christina falls mindanao, postcard, postcard project on October 12, 2011 by Yami. 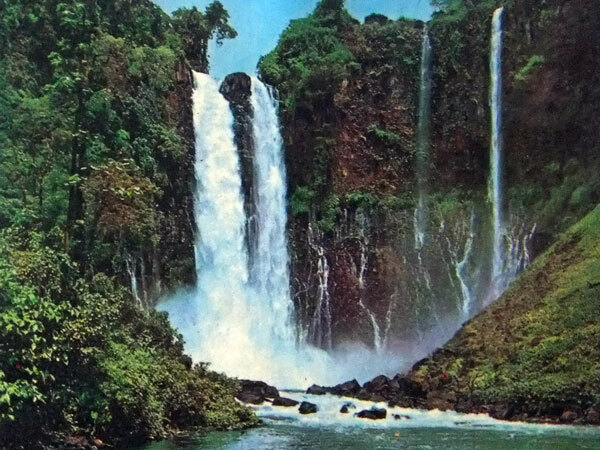 I’d been to Iligan just last year and I find it very beautiful and a very nice place. Hope I can visit the place again.